“The Sun, quite obviously, is the first order driver of Earth’s climate, but a much neglected second order driver can contribute significantly to short-term variations. The theory proposed herein is that periods of active Earth tectonism can be correlated to periods of active climate change and climate related events. Increased global tectonic activity equates to more faulting and crustal plate movement, which leads to more global heat release from faults, fractures and volcanoes that are more active. Altered heat input equates to climate change. 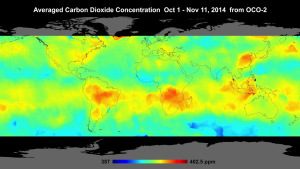 A new NASA satellite finds the highest levels of atmospheric CO2 in the Southern Hemisphere. One would have expected the highest levels over the Northern Hemisphere where the highest concentration of fossil fuel use occurs. This result is the first publication of the satellite’s measurements so it may be an anomaly. Note the scale on the bottom of the chart, that ranges from 387 to 402.5 ppm atmospheric CO2. As you can see the more red the coloring on the chart the higher the CO2 level. Roughly the red begins about 400 ppm. The reddest areas are over South America, Africa, Indonesia, China, the Northern Pacific East of Japan and the Southern Pacific East of Australia. The Renewable Energy Industrial Index (RENIXX ®World), is composed of the world’s 30 largest renewable energy companies. The 30 companies get the majority of their income from wind, solar, biofuel, geothermal, hydropower or fuel cells. The stock index was set up to allow the shareholder to profit by the expected surge in value of these companies as the green revolution unfolded. Unfortunately for the investors, the stock value which surged, peaked in the 2007 -2008 timeframe, has been a downhill ride since then. The glib promises of the performance of these renewables has not materialized and the Nations that have heavily subsidized these renewables can no longer afford them. A Washington Times-Community posting authored by Steve Goreham titled “So, how’s your green energy stock doing?” discusses the history of the Index. For instance, in a private meeting, Al Gore impressed the Deutsche Bank Asset Management team causing them to establish the RENIXX and the rest is history. One wonders how many investors have lost money believing that Gore knew some real science. On the other hand, Mr Gore is rumored to have made $200 to 300 million himself selling carbon offsets and his stake in the Chicago Merc’s Carbon Market. He may be weak on science but he knows how to make a buck. The posting is a good read that I recommend to you. The whole story with the chart of the Index’s rise and fall are in his article. Also he talks of the thirty companies, of which 10 are headquartered in China, 10 in Europe, and 7 in the US. Click here to read his posting. What is the source of geothermal energy? According to Terrestial Energy, written by William Tucker, if you drill a 1000 feet (305 meters) deep hole, the temperature at the bottom of the hole is 16F (10C) higher than at the top. Tucker says that the average temperature of the ground is 54F (11C) so the bottom of that hole would be 70F. The Homestake Gold mine in Lead SD, discovered in 1876, produced 40 million ounces of gold and 9 million ounces of silver. At the time of its closure in 2002, the mine was more than 8000 feet below the surface Based on Tucker’s formula, the temperature at the 8000 foot level would be around 180F unless cooling air was introduced. . At one time, one of my relatives (by marriage) was the engineer responsible for keeping the temperature in the mine at a level that would allow people to work. And his description of what was needed to do that was pretty impressive. He explains that the source of this heat energy as follows: “Some of it is due to gravitational forces. As the earth is pulled inward, some of this force is translated into heat. Another portion is residual heat from the earth’s formation. According to the commonly accepted theory, originally proposed by Immanuel Kant, the solar system precipitated out of a huge swirling dust cloud, where particles kept colliding with each other until they agglomerated into the sun and the planets. In the later stages, this involved huge collisions among very large objects. These impacts generate large amounts of heat, some of which still remains in the earth’s core. Together gravitational forces and residual heat probably account for about 40 percent of the earth’s temperature – the exact figure has still not been determined. Tucker draws some conclusions from this when he says: “Why don’t we just take the source of that heat – the uranium or thorium – bring it to the surface, and reproduce or even accelerate the process that produces this heat in a controlled environment?